In the United States alone, more than 1 million people are living with Type 1 diabetes, and approximately 80 people per day, or about 30,000 per year, are newly diagnosed. The global incidence of Type 1 diabetes is increasing at a rate of 3-4 percent per year, especially among younger children. 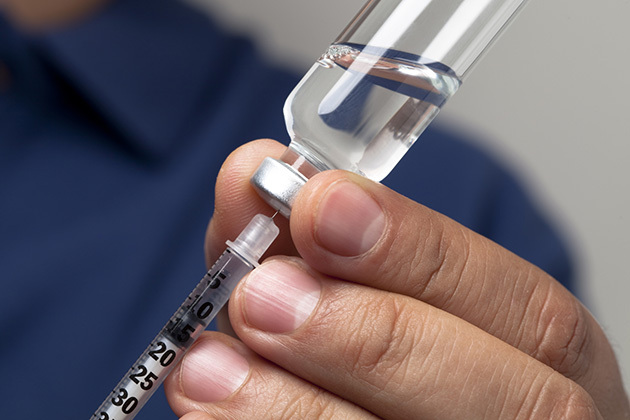 Despite continual improvements in insulin, insulin delivery methods, and home glucose monitoring methods, most people with Type 1 diabetes do not achieve recommended levels of glycemic control. Some studies, including those conducted as part of the Diabetes Control and Complications Trial, indicate that intensive treatment for those with Type 1 diabetes has no effect on quality of life. Other studies suggest that intensification may enhance quality of life by reducing the immediate and chronic effects of hyperglycemia. Still other studies suggest that very intensive regimens may reduce quality of life through highly demanding self-care regimens and increased incidence of hypoglycemia. A new therapy for diabetes might mean that, instead of injecting insulin once a day or wearing pumps, those with Type 1 diabetes would just need an injection of collagen mixed with pancreatic cells every few months. In a preclinical animal study, Purdue University researchers, in collaboration with the Indiana University School of Medicine, developed the first minimally invasive therapy to successfully reverse Type 1 diabetes within 24 hours and maintain insulin independence for at least 90 days. According to Clarissa Hernandez Stephens, a graduate researcher at Purdue's Weldon School of Biomedical Engineering, the researchers plan to account for differences from mice to humans by helping dogs first. Type 1 diabetes affects about one in every 100 companion animals in the U.S., including dogs and cats, and diabetes in dogs occurs similarly in humans. To date, treatment has been the same for dogs as well as humans — glucose monitoring throughout the day and insulin administration after meals. The cure would also be similar — a new set of pancreatic cells to replace islets that aren’t releasing insulin to monitor blood glucose levels. So far, researchers have been unable to produce effective islet transplantation therapy because the current method of delivering islets through the portal vein of the liver is too invasive, and the human immune system destroys a large percentage of transplanted cells. Also, in islet transplantation, multiple donors are needed. In this study, researchers changed how the islets were packaged and injected the solution through the skin instead of through the liver, a procedure that is far easier on the patient. To remove the need for transplanting in the liver, the researchers thoroughly mixed mouse islets with the collagen solution. After injecting under the skin, the body recognizes the collagen and supplies it with flood flow to exchange insulin and glucose. The next step will be a pilot study in dogs with naturally occurring Type 1 diabetes, planned in collaboration with Purdue’s College of Veterinary Medicine.